Britain would lose its EU budget rebate were it to decide to cancel Brexit and stay in the bloc, the European Commission’s budget chief has said. Günther Oettinger told reporters in Brussels that such a rebate was “no longer appropriate” in a family of nations. He added that the question of a second EU referendum was something that was “solely in the hands of the legitimately democratically elected government” of the UK. 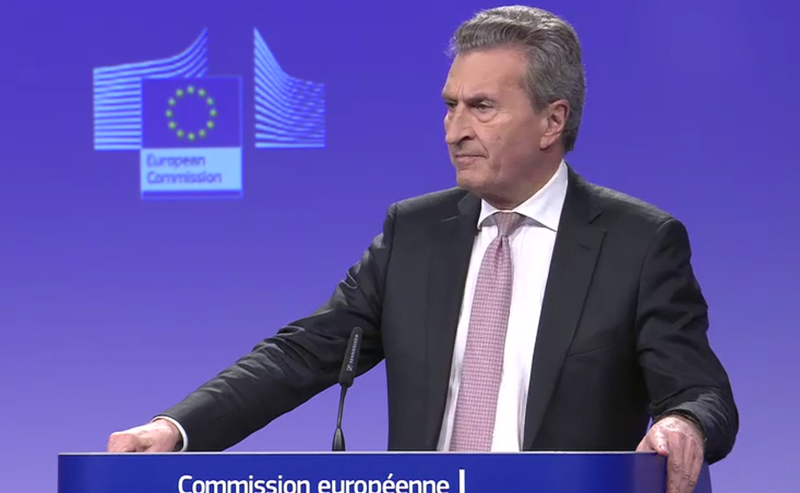 Describing Britain’s €6.2 billion (£4.9 billion) cashback as “the mother of all rebates” Mr Oettinger said the payment would still be gradually be reduced to zero in stages. “In the improbable but pleasant case that the UK would remain – I would certainly find that to be absolutely fabulous but I can’t imagine it – in that instance, then the gradual exit from the rebate would still be kept. I think it is something which is no longer appropriate in a family of 27,” Mr Oettinger said. Britain’s rebate, which has been in effect since 1985, reduces the country’s contribution to the EU budget by around two-thirds of what it would otherwise be. The rebate’s proponents justify it on the basis that the UK does not receive as much from the Common Agricultural Policy as other net contributors because of its less agricultural economy. In July the French European Affairs minister Nathalie Loiseau indicated that Britain could stay in on the same terms as it enjoyed now.However the UK rebate needs to be renewed in every EU budget period by negotiation between member states, and it is not being renewed in this coming period because of Britain’s planned departure. 28/31 Barnier's "deal like no other"
29/31 "My deal or no deal"
Britain is currently set to leave the bloc on 29 March 2019, exactly two years after Theresa May triggered Article 50 of the European Union treaty. The terms on which it will do so are yet to be agreed, with the risk of a no-deal still looming. The Government has said it will not hold a second referendum, but Labour has not ruled one out in the even of a no-deal, though it says it respects the result of the first referendum.